The house we currently live in has a formal living room and a family room. The TV, wii, and all other sorts of kid-entertainment are in the family room. Since the kids spend most of their time in the family room, we've had a pretty white slipcover on the sofa in the formal living room. The house we owned in Massachusetts had one main living area where the kids spent most of their time. I learned quickly that I didn't like having to launder white slipcovers constantly, so we used a tan slipcover in our Massachusetts house. The house we're moving into also has one main living area. So it begs a question. Do I stick with my pretty white slipcover and launder it constantly? or do I use a slipcover with color? I have been smitten with this gray velvet slipcover that Comfort Works created for an Ikea Ektorp Sofa like the one I have. It's been making me think that I could totally go with grays in my living room. Pretty, isn't it? Ikea also makes a gray slipcover although it is more of a charcoal and is made of linen. So I ask your opinion, my dear readers...white or gray? What do you think? I have the IKEA ektorp slipcover in gray and white. So far I changed them out once, from white to gray. When they were white I was afraid to even let my daughter into the living room. Now they are gray. The gray hides all the stains and is more durable then the white. The fabric seams stiffer. However, I dont like that particular gray color, it is to much of a blue gray. But I love my ektorp sofas and my slip covers. I would say to get the gray slip cover & save the white one. You can always use it for special occasions or when the kidlets are big enough not to get it dirty. You commented that the white one is beautiful so I think you would regret getting rid of it totally. Keep us updated on your decision!! GRAY!!! So much easier to care for then the white. I had the white and it drove me nuts have to wash it ALL the time. A tiny stain sticks out like a sore thumb on a white cover. I'd go with the Gray...much easier on you! GRAY, hands down. You'd be crazy to do white with little kids!! I love that gray, and you will still have the white one, if you change your mind! Gray, so you have less trouble, and the white one is for the time, when the kids prefer their rooms. Grey is in, it is the new color and, according to my sources, will be for the next 10 years. My own opinion? I love the great slipcover, and velvet would be divine. WHITE! Just kidding, if you find laundering it to be a hassle and you can afford to buy an extra cover...I say, "Go for the gray!" The white slip cover is always so nice and crisp to see when you walk into a room. But........that gray slipcover is so gorgeous and adds a touch of class! I would def go with the gray! Grey with white pillows and a white throw! Grey too here... it brings out every other colour around it, doncha think? I *heart* the gray velvet cover - it makes my heart go pitter-pat! I think it would fit in so well with your style, esp. since you've been adding touches of blue lately. I was going to vote the white...but after screen through what the others said, I have to say...White is definitely gorgeous and comfort to the eyes but Gray...it's a smart choice and comforting to your kids to have some relax fun on the sofa..
Go gray! The ComfortWorks slipcover is absolutely gorgeous. And it screams "Wendy"! My vote...GRAY!! Accents with white! I have both the white and gray ektorp slipcovers...I use white in the spring/summer and switch to gray for fall/winter. I have three kids under age 10 and a black dog - my slipcovers get washed about once every three weeks. My only rule is no food on the couch. So I swipe the couch w/a pet hair remover thingy when needed and if something does get on the couch I use a tide-to-go stick and it comes right out. I think the gray velvet is amazing too - in fact I checked on buying it the first time I saw that pic. on another blog but no way could we afford it right now :( Your room will look great either way - white or gray you can't go wrong! The grey velvet is delicious and would hide a multitude of sins. I can't wait to see what you decide! Definitely keep us posted. Go gray and get out of the laundry room. I have to admit I love both looks and knowing how talented you are I know you will make the slip cover you choose look Fab-U-lous! the gray slipcover is absolutely gorgeous! I love what hopkins home suggests ... switching them out with the seasons. how fun! But I would go with the gray. Just for my own personal mental health. definently grey... who needs the added stress of cleaning constantly when the grey would look so chic with far less work! Definitely go with gray! I love that colour + it would be divine! Go for it! Could you dye your white one gray? That would be a huge savings. I'm too practical and say gray! I have four kids and know there is no way to keep white clean! All that aside, the gray is beautiful and looks very classy but not so much that you wouldn't feel comfy. The grey looks lovely. I wish I could convince DH that grey is NOT a dark color. I'm gonna keep trying. I would go with the grey slip cover. It'll give the room a light touch of color and it probably wont make the kids as nervous to move around the room with out getting the white dirty. White is pretty, but that gray is to die for! I have two boys ages 8 & 10 and I have WHITE! I love my white but I will say that even though it's a slip cover sofa, I made additional "slips" for them out of duck cloth that I leave on for everyday life. They aren't that noticeable, are the exact same color as the sofa and they launder easily when needed. they are easy to take off when company comes. Haven't blogged about it yet but plan to in the next couple of weeks. i have only just put the white slipcovers on my pb sofa and armchair and my boys are now both college bound. i am a bit paranoid because of the dog. i am using throws over them to possibly reduce the frequency of washings....but i do love them. i love the grey but really depends on the shade and what undertones it has....big decision. I have the wtihe one !!!! I got it from a friend who didin't need it anymore and i really love my couch ! I like them both : the white one at the grey back en otherwise . I actually think the white one is more practical. It's not like the alternative is a print that would hide potential stains. At least with the white one, you can spot bleach the occasional spot that regular detergent can't get out. The grey one, you are stuck with the spot and if you try and rub it, it will definately show wear easier. Just my thoughts. I like the grey! I luv Grey! I love white slipcovers but what is a home if you can't relax and not worry about your sofa getting "lived" on. I love the look of both, but with teen boys and a dog, keeping the white one clean is a constant challenge. Green Bead Casserole: I wish you had an email attached to your profile so I could answer you directly, but on the off chance that you read through these comments again, I'll answer here. I think you misunderstood. The covering for this sofa (and indeed many slipcovered sofas) is the slipcover itself. The sofas are not upholstered. 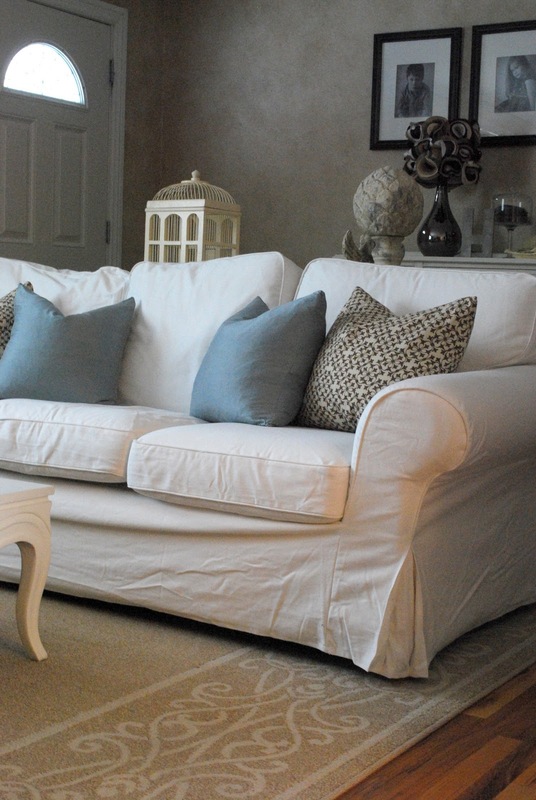 The beauty of the slipcover is that it is removable and can be cleaned more easily than upholstery. And, in this case, I can easily change the color of my sofa on a whim. So, as you can see, I'm not "covering up" my sofa at all. The slipcover "is" the sofa. I like the grey. You know something, we need a new couch, and I'm looking for a neutral...I might consider grey. I would always pick grey...it's been my new way to update my house. I love it! And velvet is yummy too. Hey Wendy! Normally I am a white sofa girl but I really love the gray!